Social & Emotional / Why being a dad is completely awesome! 3. You never thought you could love someone that much! From the moment you held that little baby, you knew that your heart was taken. Now every time you see your little one sleeping, eating, laughing, or just looking at you your heart completely melts for him or her. Just wait when he or she grows up and asks for the car! 4. You become a know it all! From the moment you knew that you were going to become a father, you probably bought tons of books and researched online about parenting and babies. Now you know how to change a diaper, set the car seat, and hopefully even help your little one go to sleep! You can even show all of your knowledge as a party trick! 5. You strive to become a better man! Becoming a dad has given you a new perspective on life. Now your number one priority is your son or daughter, and you will strive to become the best man you can be for him or her! 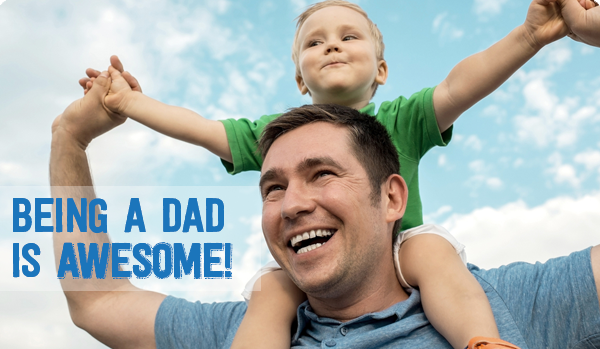 Have your own ideas of why being a dad is wonderful? Let us know! Congrats to all the dads out there making a difference in their children’s life!